Looking after your home is necessary for all of us. Let us see how Sam, Nina, Ken and their parents help each other to keep their home neat and tidy. Sam, Nina and Ken were helping their parents tidy up their home. They were going to have a party in the evening. Everything had to be neat and tidy. Just then, Ken’s friend, Aaron arrived. Sam said: Hello Aaron! Please wipe your shoes on the mat before you come in. Aaron said: At home, we leave our shoes outside the door. Sam’s mother was very happy. She said: Our shoes bring in dust and germs from outside. This way our homes stay really clean. Nina asked: Aaron, could you please help Ken put away his toys. They go into the box under his bed. Aaron said: Come Ken, I will help you with your toys. Then your room will look really neat and tidy. By then, mother had finished folding the clothes. She put them away in a cupboard. Father went to the kitchen to help Sam dry the plates. Nina finished dusting the chairs and tables. She would help her mother and wash the vegetables. 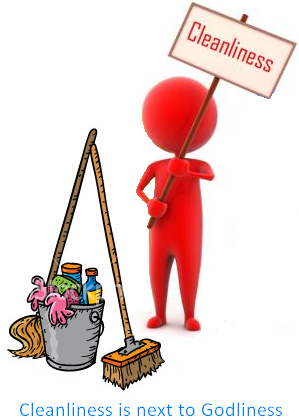 We need to keep our homes clean and tidy. Floors are swept every day. They are usually mopped with a wet cloth. Keeping things in their proper places is important. Looking after your home is important for all so that we can then find them easily. How our mother takes care of our house? Mother keeps the pulses together so that she can find them quickly. She keeps the uncooked rice, pulses and spices in tightly closed bottles. This keeps them dry and clean. Insects cannot get into them. When she has finished cutting vegetables, she throws the peel and seeds into the dustbin. The dustbin is always kept covered. Flies cannot get into the waste food. She keeps a separate bin for dry garbage like packets, bottles and plastics. At night, mother sometimes pours a little phenyle into the drain. Cockroaches live in drains. The phenyle prevents their coming out. All homes need water. We use it in many ways, every day. We need it for baths and to wash clothes. We use it to cook food and wash dishes. We need pure, clean water to drink. Water from a river or lake is cleaned and sent to our homes. We must not waste water. 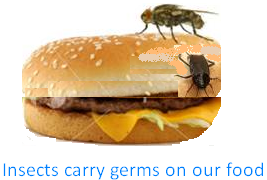 Cockroaches, flies and other insects carry germs. When they sit on our food they leave these germs behind. Germs can make us ill.
Mosquitoes lay their eggs in water. If there is water in a puddle or an open drain near your house, you may have mosquitoes in your home. Their bites are very itchy. They may give you a dangerous fever called malaria. To keep mosquitoes away, make sure that there are no open pools of water near your house. For looking after your home these small things are very important for everyone to keep in mind.